Today i want to show you how the new snapshot feature in the Document Spy can help you to understand how features in Notes works and how you can re implement such features in your own apps. As an example i show you which fields of an e-mail changes when you set a follow up flag on this particular mail. 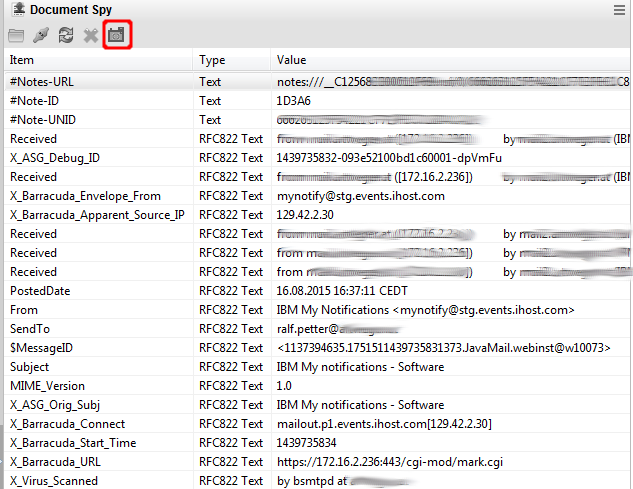 The first step is open the Document Spy in the sidebar view and select the e-mail you want to use for your analysis. All fields of the e-mail will be shown in the document spy. Create a snapshot from the mail document with the snapshot action. The snapshot of the current state of the mail document will be opened in a new window and is the baseline for our analysis. Now set the follow up flag on the mail we have selected for our snapshot and then go to your snapshot tab and press the "Delta" shortcut to reload the document as a new column. The document spy will compare the old basevalue column to the new column and will mark all rows witch changes. Values which are new have a green, changes have a red and values which are removed have a blue cell background. You can repeat the last steps for further changes to the document. For example we can remove the follow up flag again and create a new delta column in the snapshot, to see what happens to our document when the follow up status is removed. I hope you find this new feature as helpful as i do. If you have some problems or suggestions please leave a comment. Snapshot&compare is very usful improvement! Thanks a lot for his, Ralf! I have a technical question: where can I find the version of the installed DocumentSpy? and I have a suggestion: if I take a snapshot and (on the snapshot page) I create a Delta (another column) and again a Delta (again a new column) then the newer columns go out from the screen and I have to narrow them manually to see all the columns. It would be better to autosize the columns to let them all to fit within the screen. Thx. See http://www.everythingaboutit.eu/2015/08/how-to-determine-which-version-of.html for an answer to your question about the version of a plugin and thanks for your suggestion i will try to implement it in a future version of the Document Spy. Thx for sharing this great sidebar plugin. Please, can you add a Link for downloading the complete updatesite as a ZIP file. That would help to add the feature to our own inhouse updatesite.nsf. @Detlev I have added a download link on http://www.everythingaboutit.eu/p/install-document-spy.html for the Updatesite as a zip archive. If you need instructions how to install the Updatesite feel free to ask.